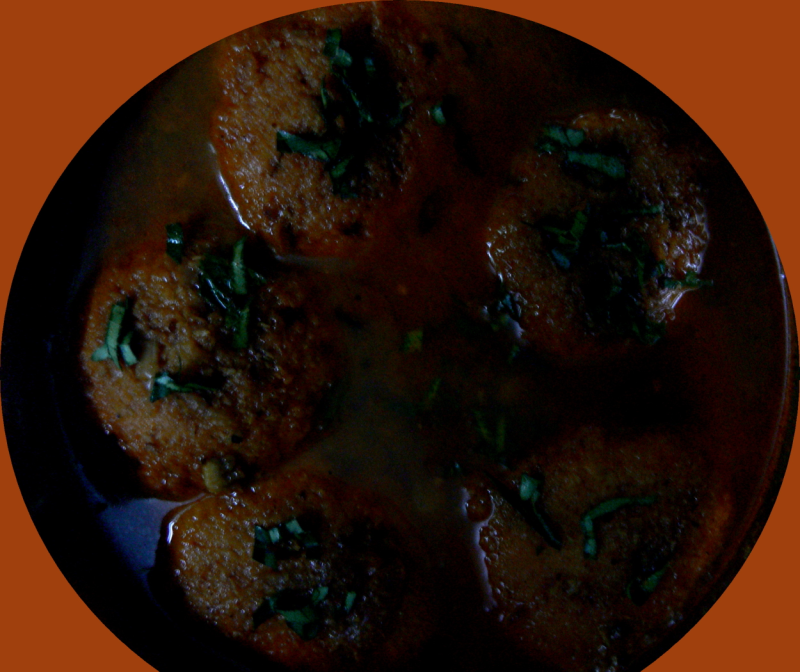 This is one of the mouth-watering delicacies of the traditional Lakhnavi recipies - Spiced mutton patties in mouth-watering gravy. Mix the keema with gram flour,onion paste(2/3rd) and 1 tsp ginger-garlic paste,1 tsp coriander powder,1 1/2 tsp red chilli powder,1 tsp cumin powder,1 tsp cardamom-cinnamon stick powder and 1/2 tsp garam masala powder.Mix well and leave it for 30 mins. Make five balls of the same size,hollow them in the middle and place a whole boiled-egg in each balls and cover them completely with the keema-kofte batter. Heat 100 ml refined oil in a kadai. Dip each kofta in beaten egg and deep-fry.Cut each into half.Keep this aside.Now prepare the gravy. Heat 2 tsp oil in a pan and add chopped onion,chopped tomato,1 tsp ginger-garlic paste,1 1/2 tsp red chilli powder,1/2 tsp garam masala powder and cook on medium flame till oil separates fom the mixture. Then add 1 tsp coriander powder,yoghurt,water,1 tsp mutton masala and few coriander leaves and cook for 10 mins,till oil separates and the gravy is blended well. Place the warm kofte in a dish and pour the hot gravy on top of the kofte. Garnish this Succulent mutton kofte with chopped fresh coriander leaves.